Egypt Is in Europe, Right? 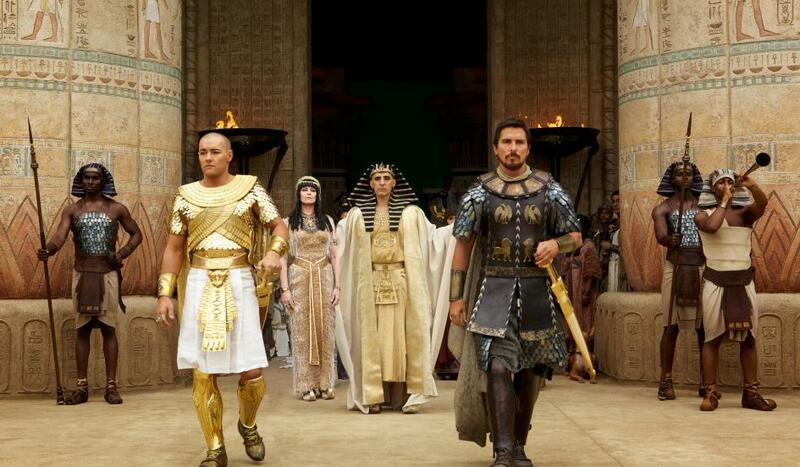 Director Ridley Scott chose Anglo-Saxon actors Joel Edgerton, from left, Sigourney Weaver, John Turturro and Christian Bale to portray African biblical characters. Ridley Scott’s “Exodus: Gods and Kings” doesn’t accurately illustrate the story of Moses from the biblical Book of Exodus. Instead it depicts something that is undeniably woven into the film industry — Eurocentrism. According to the Bible, the story of Moses originates in Egypt. However, Scott chose famed Anglo-Saxon actors like Christian Bale, Joel Edgerton and Sigourney Weaver to play the African biblical characters of Moses, Ramses II and Queen Tuya. The $140 million film is full of special effects and intense scenes with Bale almighty raging through the Red Sea and courageously fighting enemies. One of the film’s promotional photos shows the lead cast ironically protruding out of a backdrop of brown-skinned servants. The image captures the stark contrast between the major and minor characters and has left people wondering why religious films are consistently “white-washed” and blasphemous. After the trailer was released, social media was full of side-by-side Egyptian paintings and photos of white actors along with the hashtag #BoycottExodusMovie. Money might have been the root of evil in this situation, according to Scott. He responded to the criticism by saying that he would have been unable to fund his project with Egyptian actors in his lead roles. Is financing really the main problem in producing completely accurate movies, though? Scott’s derogatory reference to “Muhammad so-and-so” proves that it isn’t. While funding is a major concern for filmmakers, the fact that funding changes depending on the ethnicity of the characters is the bigger problem. Nonetheless, numerous films with lead minority roles have been successful in the past. Stemming from his experience, Gerima knows that success in the film industry is about quality and ownership, especially for black minorities in the United States. Prianca Lal, the president of Bethel Campus Fellowship at Howard University, isn’t shocked by the apparent white-washing of religious films, even though she is a devoted Christian. “I am honestly not surprised that the ethnicities of biblical characters are misrepresented considering the world system that we live within and the assertion of white superiority,” she said. “I hope at least the message of such films are portrayed properly. Unfortunately, Lal didn’t always know where events in the Bible took place. Apparently, many people don’t know that a large portion of the Bible takes place in parts of the Middle East and Africa. Rupert Murdoch asked Twitter, “Since when are Egyptians not white?” Even Fox News anchor Megyn Kelly boldly asserted that Jesus was white in a news segment about Santa Claus, disregarding scriptures like Revelations 1:15 (“His feet were like burnished bronze … “) and the birthplace of Christ. Other Europeans and Americans have voiced that same mentality, which could be because religious ignorance is dominating the big screen and further contributing to how people perceive the Bible. With major movies like “Noah,” ”The Passion of the Christ” and even “The Mummy,” it makes it largely impossible to erase the “white savior” theme in movies. The subtitle of the “Exodus” may be the most representative part of the film. While Scott told screenrant.com that the inclusion of the phrase “Gods and Kings” was for copyright purposes, it alludes to the pervasive ideology of white dominance, which is subliminally affirmed through white lead characters in films. Robyn Hutson writes about television and film for 101Magazine.net.